Danny O’Brien didn’t land the listed Bagot Handicap in which he had the favourite, but the trainer still came away from the first Melbourne meeting of 2015 with the New Year's Day feature event. 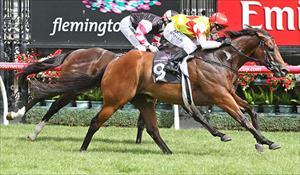 The Flemington horseman produced hardy six-year-old Decircles to win the $150,000 Group 3 Standish Handicap. The 1200-metre event preceded the $150,000 Listed Bagot Handicap (2800m), in which O’Brien saddled hot favourite De Little Engine, and while he could only manage third spot, Decircles stood tall for the biggest win of his career. The Encosta de Lago gelding went two spots better than third placing in last year’s event and O’Brien said while Decircles was no superstar he was one horse he was proud to have in the stable. “He’s a horse that ran second in the Sires (Group 2 VRC Sires Produce Stakes) as a two-year-old and he’s had a wind operation, but this time of the year the last couple of seasons he’s always put himself in the frame,” O’Brien said. Decircles jumped well from his wide barrier and while Fab Fevola almost pinched the preceding event by sticking hard against the outside fence, jockey Stephen Baster edged him over to sit just off leader Lord Of The Sky down on the inside rail. Lord Of The Sky’s jockey Noel Callow was able to dictate in front, which resulted in Baster getting busy aboard Decircles at the 300m and while Lord Of The Sky skipped more than a length clear at the 200m, Decircles knuckled down impressively late. The $9 chance, who touched $12 in betting, hit the lead 30m out and pulled away late to score by three-quarters of a length from Lord Of The Sky ($4) withReparations ($3.80 fav) working home well once into the clear to finish a further length back third. O’Brien said Decircles would be back at Flemington on 17 January where he would get a shot at another Black Type win, in the $120,000 Listed Chester Manifold Stakes (1400m).